Marilyn SanClemente March 6, 2014 March 6, 2014 Baby cards, Handmade cards, Stampin' Up! Since this is Throwback Thursday, I am showing a card that I made using an old technique (making a card that looks like a onesie) and a former Hostess or Sale-a-bration Stamp Set – Punches Three! This week we needed a card for a co-worker of Dave’s that just had a baby. So while shopping for Baby gifts, my daughter found this really cute bathing suit with coverup and matching hat. This brought back such great memories of when my 18 year old was just turning 1 and had the same bathing suit, but in pink with a pink polka dot hat!! So of course we had to get this bathing suit! The new color this year is the aqua shade that Stampin’ Up! has named Coastal Cabana. Since the hat and bathing suit are the aqua color, I selected the Fresh Prints designer paper pack to cover the front of the card. This designer paper has a lot of the Coastal Cabana color on the patterns. The details on how to make this card: 1. Cut a piece of white card stock in half the long way at 4 1/4″. Score at 5 1/2″ and fold in half. 2. Cut a piece of designer paper to 4 1/4″ x 5 1/2″ and attach to the front of the card. 3. With a 1 3/4″ circle punch, punch a half circle in the center of the top fold of the card to make the neckline. 4. Punch a partial circle in the bottom corner of the card. I trimmed after I punched the circle to make the opening more smooth. Do the same on the other corner. 5. Measure 1″ down from the top fold of the card and go in 3/4″. Using a ruler, draw a line from this point to the top of the leg holes and cut with a pair of scissors. 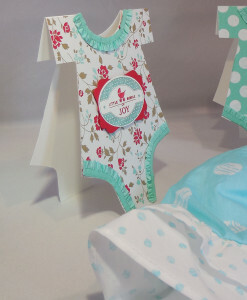 And you have your onesie shaped card! Now it is time to decorate the front of your card! I used the retired set – Punches Three to make the label on the front of the card. I used Strawberry Slush and Coastal Cabana ink on the polka dot card and Real Red with Coastal Cabana ink on the flowered card. The stamped image is punched with the large oval punch and layered onto a piece of coordinating card stock cut with the decorative label punch! I decorated the neck and leg hole edges with the Coastal Cabana ribbon which I attached with Sticky Strip. So which card do you like better?